On every trip to the UK I have managed to find some incredible book bargains, some in the new bookshops, and others in the second hand places. For example I spied a book on classic cars in Waterstones, a large British book chain, and this book with several colour plates was on special at 75 percent off. I paid six pounds 25 pence plus one new penny extra to get a plastic bag strong enough to carry it. It has everything in it from the 1901 Curved Dash Oldsmobile up to the Dodge Viper, a long time favourite of mine, a car with more neddies under the bonnet than you could ever use on the road, and on the race track it was truly awesome. All the steering was done with the right foot, and I loved it. Another book purchase was found in a second hand gift shop on the quay at Exeter. This is a wonderfully detailed history of motor racing from 1894 (yes, 1894) until 1989. 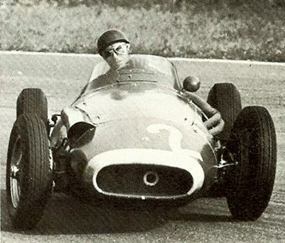 Juan Manuel Fangio with a tad of oversteer! Cost? Seven British pounds ninety five new pence, or around 350 Thai baht. For that small sum I have gleaned such details as the win by Christian Lautenschlager in the 1914 French Grand Prix. His Mercedes had a 4.5 litre engine with four cylinders. Two inlet valves and two exhaust valves with an overhead cam shaft – not bad for 1914. His winning time was seven hours eight minutes for the 700 km race. It makes our present day over-pampered race drivers seem like a bunch of pansies. But I shouldn’t be so tough on them, they are a bunch of over-paid pansies. The 1967 Italian GP was also memorable, with Jim Clark in the Lotus losing one complete lap in the pits, to then chase the field, drive through it and take the lead, only to run out of fuel on the last corner and was passed by John Surtees and Jack Brabham. Surtees won by half a car. And his car? It was the Honda RA 300 with a 48 valve V12 developing 405 bhp at 10,000 rpm. Such wonderful history, and here we are in 2013 and Honda is coming back as an engine supplier! As I turned the last page of 1989, there was another shame. It was a list of all the Formula 1 cars of that year. There were 20 different makes of cars. These days we are lucky if we get 20 cars on the grid, let alone 20 different teams. For interest, here they are: AGS, Arrows, Benetton, Brabham, Colloni, Dallara, EuroBrun, Ferrari, Ligier, Lola, Lotus, March, McLaren, Minardi, Onyx, Osella, Rial, Tyrrell, Williams and Zakspeed. Would you pay 13 mio for a wreck?